A new year dawns, 12 months stretch out ahead of us and if we enjoy summer for a while we might get to have a second one at the end of the year to really cheer ourselves up. But what of the tech world, what will that look like a year from now, I hear you ask rhetorically in my head. Well, much the same as it does today I warrant, but the trend lines are drawn and there are already reckons to be had so without any ado at all, here is: The Year In Preview. Apple will no doubt release new phones or iPads this year. That's not much of a prediction because, let's face it, they've got boxes to ship and well, chop chop, let's get to it. The phones will have more cameras and faster chips but the battery life won't be any better than the current model once you start using all that lovely stuff. Such is life. But charging the battery could well be far more interesting. Apple, you may recall, launched a product called AirPower quite some time ago, which almost immediately disappeared without a trace. This was a way of charging devices wirelessly - no more plugs, just plonk the device on a charging plate and stand back. In its ever more fervent quest for fewer holes in its devices, this will surely be a game changer for Apple if only they can make it work. They were struggling, it would seem, because the product disappeared and was Never Mentioned Again in true Death of Stalin style - until recently. A blogger noticed a mention of the wireless charging capability on a website listing the capabilities of the new iPhone XS extended battery sleeve. While Apple swiftly removed the mention, and presumably fired the staffer responsible, salted the earth beneath his desk, relocated his family and erased his iTunes account (gasp), it's important to remember that Apple may actually have a product now, thanks to a Kiwi start-up that it bought last year called PowerbyProxi. If Apple does produce a device that charges wireless (and as well as a wired connection) then it will do what it always does - help trigger the landslide move towards such offerings even as Google device owners wail about how they've had it for years. Either way, there's hope yet for the PbP team and a great product set future. 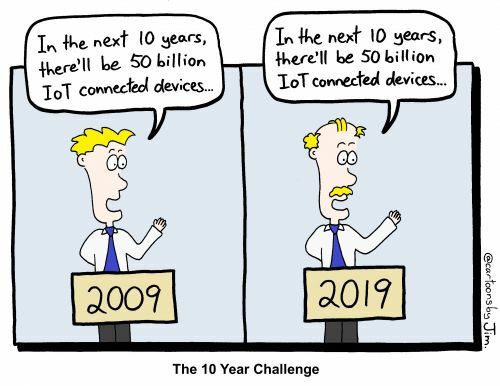 Speaking of devices, I can't help but marvel at the Internet of Things (IoT) and the ongoing Rise of the Machines that we're told will hit 50 billion devices by … well, some date or other. I'm sure it will. There's no need for the benefits of internet-protocol based communication to be solely the purview of human beings. My toaster should be able to spam your refrigerator whenever it wants, or something like that. And while I'm not sure we'll hit 50 billion devices this week, the push into home automation alone will see us all become far more adept at navigating the ways of the IoT. There are, however, concerns. Privacy concerns, obviously (and I'll spare you the links to the "intimate device" market discussions although their focus on security is profound to say the least) but also getting users to actually sign up to enable these things. For many years we talked about how there would soon be more cows on the internet in New Zealand than people. The National Animal Identification and Tracing (NAIT) system was to deliver millions of tagged animals (cows and deer mostly) to our doorstep so we could both monitor their movements and also sensibly report counterfeit cows and such like when we see them. Unfortunately, farmers weren't terrible keen on NAIT and despite it being introduced in 2012 there has been intermittent uptake and records have not been well maintained. That of course came to head with the outbreak of mycoplasma bovis when the Ministry for Finding Cows discovered it couldn't. So, the Minister in charge ramped up enforcement and now farmers are either paying fines or complying and hopefully we can figure out which farms to quarantine should the need arise. But IoT isn't just for farms and homes and devices of negotiable virtue, it's also for your pets! That's right, Vodafone UK has released a series of IoT tracking devices that fit snugly on Fido or Pusskin's collars and mean you can track your wayward animals should the need arise. You'll also be able to use them as part of your bot army when it comes time to influence the next global election, but hey - that's tomorrow's problem. Which brings us to the year's big ticket item - privacy. This is the year we have to start treating data privacy seriously before it's too late, and by us I mean everyone who currently doesn't seem to give a hoot about privacy - users and producers of apps alike. For the producers of apps that want your data we need to see more responsibility in gathering data, more responsibility in retaining or not retaining data and a heck of a lot more responsibility taken in securing our data. But likewise, for our users it's long past time where they can treat private information with a cavalier attitude. "Password123" isn't going to be enough to make sure your retirement savings aren't removed by someone who knows more than they should about your bank account details and "but I wanted to know which Buffy character I most resemble" isn't going to cut it when you give away every connection, every post, every draft, every photograph and every story you ever read on a social media platform. Our users need to get smarter and they need to do it sooner rather than later because all we're doing at the moment is feeding the beast and that's not going to be sustainable. I'd very much like my kids not to find out the hard way about cyber-stalkers and I'd very much like that to be true for all of us. Wired - Facebook's 10 year challenge is just a harmless meme, right?